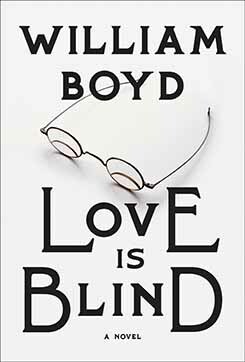 The following is from William Boyd's novel, Love Is Blind. Brodie Moncur, a brilliant young piano tuner, tours Europe with John Kilbarron, "The Irish Liszt", and enjoys a life of luxury. But when Brodie falls in love with Kilbarron's consort, the Russian soprano Lika Blum, he is prepared to give everything up. William Boyd is the author of 14 books. His work has won honors that include the Whitbread Award, the John Llewellyn Rhys Prize, and being shortlisted for the Booker Prize. Brodie Moncur stood in the main window of Channon & Co. and looked out at the hurrying pedestrians, the cabs, carriages and labouring drays of George Street. It was raining—a steady soft rain driven slant from time to time by the occasional fierce gust of wind—and, under the ponderous pewter light, the sooty facades of the buildings opposite had darkened with the water to a near-black. Like velvet, Brodie thought, or moleskin. He took off his spectacles and wiped the lenses clean on his handkerchief. Looking out of the window again, spectacle-less, he saw that rainy Edinburgh had now gone utterly aqueous. The buildings opposite were a cliff of black suede. He replaced his spectacles—hooking the wire sides behind his ears—and the world returned to normal. He slipped his watch from his waistcoat pocket. Nearly nine o’clock—better start. He opened up the glossy new grand piano that was on the display dais, propping up the curved lid with its inlaid mirror (only for display purposes—his idea) the better to present the intricate machinery—the “action”—inside a Channon grand. He removed the fall from over the keys and undid the key-block screws. He checked that no hammers were up and then drew the whole action forward by the flange rail under the front. As it was a new piano it drew out perfectly. Already a passer-by had stopped and was peering in. Drawing out the action always compelled attention. Everyone had seen a grand piano with the lid up but having the action on display somehow altered every easy assumption. The piano no longer seemed familiar. Now all the moving parts were visible beyond the black and white the hammers, the rockers, the jacks, the whippens, the dampers—its innards were exposed like a clock with its back off or a railway engine dismantled in a repair shed. Mysteries—music, time, movement—were reduced to complex, elaborate mechanisms. People tended to be fascinated. He untied his leather roll of tools, selected the tuning lever and pretended to tune the piano, tightening a few strings here and there, testing them and resetting them. The piano was perfectly tuned—he had tuned it himself when it had emerged, pristine, from the factory two weeks ago. He tuned F a modicum on the sharp side then knocked it in—back into tune—with a few brisk taps on the key. He supported a hammer-head and needled-up the felt a little with his three-pronged voicing tool and returned it to its position. This pantomime of tuning a piano was meant to lure the customers in. He had suggested, at one of the rare staff meetings, that they should have someone actually playing the piano—an accomplished pianist—as they did in showrooms in Germany, and as the Erard and Pleyel piano manufacturers had done in Paris in the 1830s and drawn huge crowds. It was hardly an innovation—but an impromptu recital in a shop window would surely be more enticing than listening to the mannered repetitions of a piano being tuned. Donk! Ding! Donk! Donk! Donk! Ding! He had been overruled—an accomplished pianist would cost money—and instead he was given this job of display-tuning: an hour in the morning and an hour after luncheon. In fact he did attract spectators, although he had been the single beneficiary—he wasn’t sure if the firm had sold one more piano as a result of his demonstrations, but many people and not a few institutions (schools, church halls, public houses) had slipped into the shop, pressed a calling card on him, and offered him out-of-hours piano tuning. He had earned a good few pounds. So, he played A above middle C several times, to “get the pitch,” pointedly listening to the tone with a cocked head. Then played a few octaves. He stood, slipped some felt mutes between strings, took out his tuning lever, set it over a wrest pin at random and gave it some tiny turns, just to deliver torque, then eased the pin slightly to “set the pin” and hit the note hard, to deliver a cast-iron tuning, feeling it in the hand through the lever. Then he sat down and played a few chords, listening to the Channon’s particular voice. Big and strongly resonant—the precision thinness of the sounding board (made from Scottish spruce) under the strings was the special Channon trademark, its trade secret. A Channon could rival a Steinway or a Bösendorfer when it came to breaking through an orchestra. Where the spruce forests were in Scotland that Channon used, what trees were selected—the straighter the tree, the straighter the grain—and what sawmills prepared the timber, were facts known only to a handful of people in the firm. Channon claimed that it was the quality of the Scottish wood they used that made their pianos’ distinct, unique tone. He looked round. 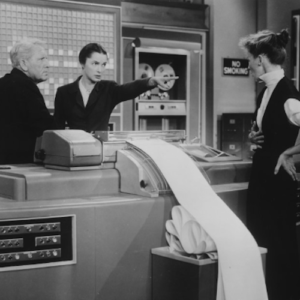 Emmeline Grant, Mr. Channon’s secretary, stood at the window’s framing edge, beckoning at him. She was a small burly woman who tried to disguise how fond she was of him. He stood, thought about closing the piano down but decided against it. He’d be back in ten minutes. He gave a deep bow to his small audience and followed Mrs. Grant through the showroom, with its parked, glossy pianos, and into the main hall of the Channon building. Austere unsmiling portraits of previous generations of Channons hung on olive and charcoal-grey striped wallpaper. Another mistake, Brodie thought: it was like a provincial art gallery or a funeral parlour. Brodie went through the back, through a leather, brass-studded door into the warehouse area where the workshop was located. It was a cross between a carpentry shop and an office, he always thought, the air seasoned with the smell of wood shavings, glue and resin. He pushed open the door and found his number two, Lachlan Hood, at work replacing the centre pins on a baby grand—a long job, there were hundreds of them. He slid up his roll-top desk and opened the drawer where he kept his tin of tobacco. “Margarita” was the brand name: an American blend of Virginia, Turkish and perique tobacco, made by a tobacconist called Blakely in New York City and to be found in only one retailer in Edinburgh—Hoskings, in the Grassmarket. He took one of the three cigarettes he had already rolled and lit it, inhaling deeply. Ainsley Channon was the sixth Channon to head the firm since it had been established in the mid-eighteenth century. On the landing was a 1783 Channon five-octave spinet—the first Channon model to be a true success and which began the firm’s fortunes. Now it was the fourth-largest piano manufacturer, some said the third, in Britain, after Broadwood, Pate and—possibly—Franklin. And, as if to confirm the length of this lineage, Ainsley Channon dressed in a style that had been fashionable half a century before. He wore luxuriant Dundreary whiskers and a stiff wing collar with silk cravat and pin. His receding grey hair hung down long behind his ears, almost touching his shoulders. He looked like an old musician, like a stout Paganini. Brodie knew he couldn’t play a note. The room was large and gloomy—the gas lamps lit even though it was morning—with three tall, twelve-paned windows looking out over George Street. Brodie could make out the high, thin spire of St. Andrew’s and St. George’s West Church through the still-falling smear of misty rain. “Well, we’ve got a Channon challenge for you now . . .” He paused. “You know we opened that Channon showroom in Paris, last year . . .” Ainsley said. “Well, it’s not going well,” Ainsley confided, lowering his voice as if someone might overhear. “In fact it’s going very badly, between ourselves.” He explained further. Ainsley’s son, Calder Channon, had been appointed manager in Paris and although everything was in reasonable shape, seemed well set up, contacts made, stock warehoused, regular advertisements in the Parisian press placed, they were losing money—not worryingly—but at a steady, unignorable rate. Brodie was to go to Paris as soon as possible—in a week, say, once his affairs were in order—and become Calder Channon’s number two. Assistant manager of the Paris showroom. There was only one thing to have on his mind, Ainsley said: sales, sales, sales—and more sales. Ainsley seemed suddenly cheered and assured him he’d have a significant increase in salary, and his position—and his salary—would be reviewed in six months, depending on results. Back in the workshop Brodie smoked another cigarette, thinking hard. He should be pleased, he knew, incredibly pleased—but something was bothering him, something indeterminate, naggingly vague. Was it Paris, the fact that he’d never been there, never been abroad? No, that excited him: to live, to work in Paris, that would be—Lachlan Hood sauntered in from the shop. “Mais est-ce que vous parlez français, monsieur? “All right, I admit it. The key thing is I speak enough French. Which is about one hundred per cent more French than you do.” He offered Lachlan a cigarette, and smiled patronizingly. From Love is Blind. Used with permission of Knopf. Copyright © 2018 by William Boyd.